Technology companies are an aspirational career path for top Millennial talent who are less likely to be attracted by rigid and old fashioned management styles and industries. With such pulling power, do the most competitive firms still have to pay top dollar to attract and retain the best candidates? 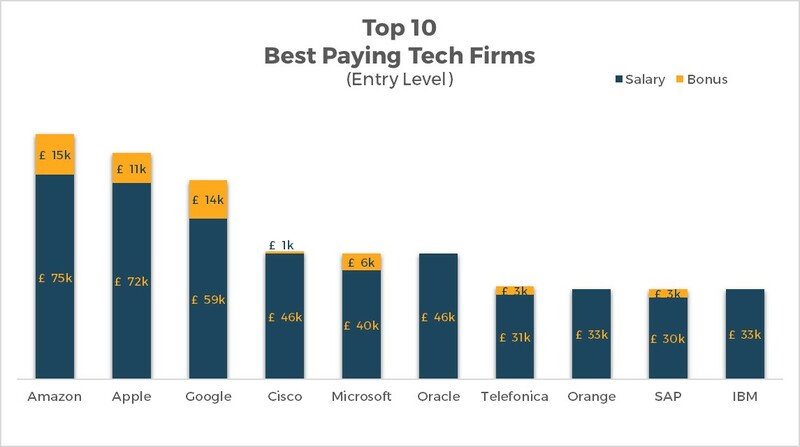 In order to produce a league table of the best paying technology firms, we analysed global salary data from 641 entry level employees (0-3 years of experience) and 504 senior employees (10-13 years of experience). Apple, Google and Microsoft top our lists for both categories with salaries and bonuses far above average rates. A clear pattern emerges correlating bonus size with innovation. Amazon, Apple, Google and Microsoft lead our rankings. These three technology giants pay extra to attract top talent: Apple for instance pays its entry-level employees a total of £83,000 a year, ie 3 times more than Vodafone. 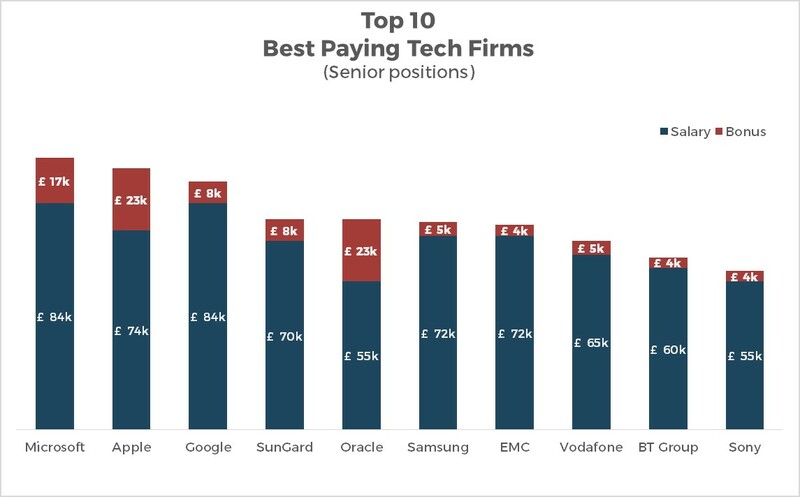 Telecom operators pay very respectable starting salaries but don't come close to the big forward thinking tech firms in our list with basic salaries averaging £30,000 and no bonuses to speak of. Driving innovation and enriching peoples' lives is the cornerstone appeal of the big technology brands. A handful of these top innovation players, the bluest of the blue chip tech brands, are willing to pay substantial bonuses to recruit and retain junior staff, despite already capitalising on their glamorous brand to generate staff loyalty. Amazon, Apple and Google pay bonuses which on average equal 1/5th of annual salaries. Not a bad start! Closing the gap with banking? Our table-toppers have such an aggressive pay policy for juniors that they are closing the gap with the financial industry. While bonuses in technology remain smaller than in banking, the diminishing pay differential added to the on-trend corporate culture and a flexible working environment with better work-life balance and many perks make up an irresistible package for Generation Y. At senior level, the pay gap between companies narrows dramatically. In junior jobs Apple pays three times more than Vodafone compared to senior roles the differential decreases by more than 50% with Apple paying 1.4 times more than Vodafone. This shows that a few star players are fiercely competing for junior talent, pushing market rates up dramatically. With glamorous brands, novelty offices, breakthrough managerial styles the leading technology firms were already attractive employers. Now, with an aggressive push on junior pay, they are outpacing traditional financial and professional services firms when it comes to campus pulling power. Working for a top investment bank no longer epitomises the graduate dream, especially since financial industry remuneration has taken a bashing in the last few years, in line with bankers' reputations. Banks are trying to shake up their corporate cultures and offer more flexibility and work-life balance but cannot compete with technology giants making their staff feel they are making a social mark on their time.